The Oxford Dictionary defines it “as a building used for storing and exhibition of objects illustrating antiquities, natural history, art, etc”. In the modern world, it is often seen as a byword for “old and outdated”. A place to put irrelevant things. A place of obsolescence. A place of history. A place of the dead. But to understand what a museum really is, one needs to delve into the origins of the word. “Museum” is derived from the ancient Greek word, mouseion – a place, a temple, dedicated to the Muses. What are the Muses? They are the patron divinities in Greek mythology, and all of them personify the arts, philosophy and learning. They were the very embodiment of knowledge. 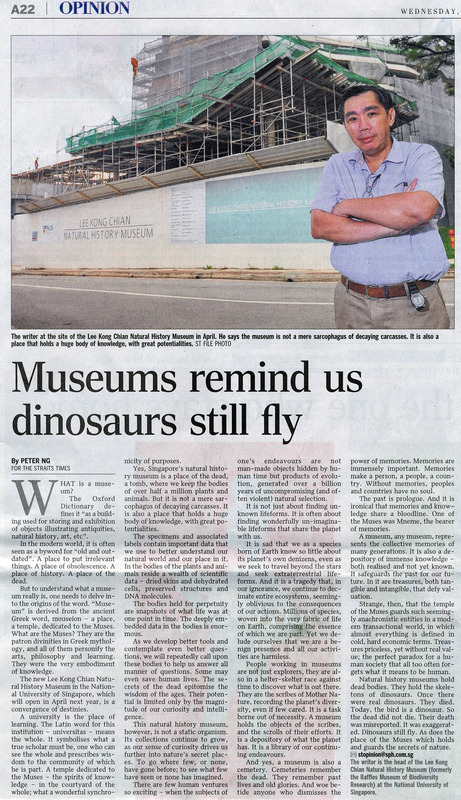 The new Lee Kong Chian Natural History Museum in the National University of Singapore, which will open in April next year, is a convergence of destinies. A university is the place of learning. The Latin word for this institution – universitas – means the whole. It symbolises what a true scholar must be, one who can see the whole and prescribes wisdom to the community of which he is part. A temple dedicated to the Muses – the spirits of knowledge – in the courtyard of the whole; what a wonderful synchronicity of purposes. Yes, Singapore’s natural history museum is a place of the dead, a tomb, where we keep the bodies of over half a million plants and animals. But it is not a mere sarcophagus of decaying carcasses. It is also a place that holds a huge body of knowledge, with great potentialities. The specimens and associated labels contain important data that we use to better understand our natural world and our place in it. In the bodies of the plants and animals reside a wealth of scientific data – dried skins and dehydrated cells, preserved structures and DNA molecules. The bodies held for perpetuity are snapshots of what life was at one point in time. The deeply embedded data in the bodies is enormous. As we develop better tools and contemplate even better questions, we will repeatedly call upon these bodies to help us answer all manner of questions. Some may even save human lives. The secrets of the dead epitomise the wisdom of the ages. Their potential is limited only by the magnitude of our curiosity and intelligence. This natural history museum, however, is not a static organism. Its collections continue to grow, as our sense of curiosity drives us further into nature’s secret places. To go where few, or none, have gone before; to see what few have seen or none has imagined. There are few human ventures so exciting – when the subjects of one’s endeavours are not man-made objects hidden by human time but products of evolution, generated over a billion years of uncompromising (and often violent) natural selection. It is not just about finding unknown lifeforms. It is often about finding wonderfully un-imaginable lifeforms that share the planet with us. It is sad that we as a species born of Earth know so little about its planet’s own denizens, even as we seek to travel beyond the stars and seek extraterrestrial lifeforms. And it is a tragedy that, in our ignorance, we continue to decimate entire ecosystems, seemingly oblivious to the consequences of our actions. Millions of species, woven into the very fabric of life on Earth, comprising the essence of which we are part. Yet we delude ourselves that we are a benign presence and all our activities are harmless. People working in museums are not just explorers, they are also in a helter-skelter race against time to discover what is out there. They are the scribes of Mother Nature, recording the planet’s diversity, even if few cared. It is a task borne out of necessity. A museum holds the objects of the scribes, and the scrolls of their efforts. It is a depository of what the planet has. It is a library of our continuing endeavours. And yes, a museum is also a cemetery. Cemeteries remember the dead. They remember past lives and old glories. And woe betide anyone who dismisses the power of memories. Memories are immensely important. Memories make a person, a people, a country. Without memories, peoples and countries have no soul. The past is prologue. And it is ironical that memories and knowledge share a bloodline. One of the Muses was Mneme, the bearer of memories. A museum, any museum, represents the collective memories of many generations. It is also a depository of immense knowledge – both realised and not yet known. It safeguards the past for our future. In it are treasures, both tangible and intangible, that defy valuation. Strange, then, that the temple of the Muses guards such seemingly anachronistic entities in a modern transactional world, in which almost everything is defined in cold, hard economic terms. Treasures priceless, yet without real value; the perfect paradox for a human society that all too often forgets what it means to be human. Natural history museums hold dead bodies. They hold the skeletons of dinosaurs. Once there were real dinosaurs. They died. Today, the bird is a dinosaur. So the dead did not die. Their death was misreported. It was exaggerated. Dinosaurs still fly. As does the place of the Muses which holds and guards the secrets of nature.